Home Baseball	Martinez wins his 10th game of the season! Martinez wins his 10th game of the season! The St. Louis Cardinals, one night after beating the Chicago Cubs, headed east to start a critical four game series against another National League Central rival…the Pittsburgh Pirates. But due to their victory over the Cubs on Wednesday, no matter the outcome of the Cardinals/Pirates series, the Cardinals are guaranteed to be in first place entering the All-Star break. On Thursday night, the pitching matchup for the first game in the series featured Carlos Martinez (9-3, 2.70 ERA) for St. Louis, taking on Jeff Locke (5-4, 4.15 ERA) for the Pirates. Martinez, who is one of five National League All-Star team final vote candidates, looked to make a strong case for himself during Thursday’s game. And throughout the night, he definitely made a strong case for himself to be the winner of the final vote campaign, with some crucial help from his teammates as well. In the bottom of the first inning, Gregory Polanco led off with a double. Neil Walker then singled, advancing Polanco to third. With runners on the corners and nobody out, Martinez got Pirates’ All-Star Andrew McCutcheon to ground into a 5-4-2 double play, throwing out Polanco at home, thereby preventing a run. Both Martinez and Locke were off to strong starts, throwing scoreless innings during the first four innings of the game, but it was during the top of the fifth inning that the Cardinals broke the game open. Randal Grichuk led off the inning with a single, bringing up Xavier Scruggs. Scruggs reached on a force attempt, putting two runners on with nobody out. Martinez contributed to the cause by hitting a sacrifice bunt, advancing the runners. Peter Bourjos was then hit by a pitch, loading the bases for Matt Carpenter, who followed with a two run RBI single, scoring Grichuk and Scruggs to make it 2-0 Cardinals. After a strikeout by Jhonny Peralta, the inning continued after Jason Heyward walked. And with the bases loaded once again, All-Star catcher Yadier Molina hit a two out, two run RBI single, which scored both Bourjos and Carpenter, making it a 4-0 game. 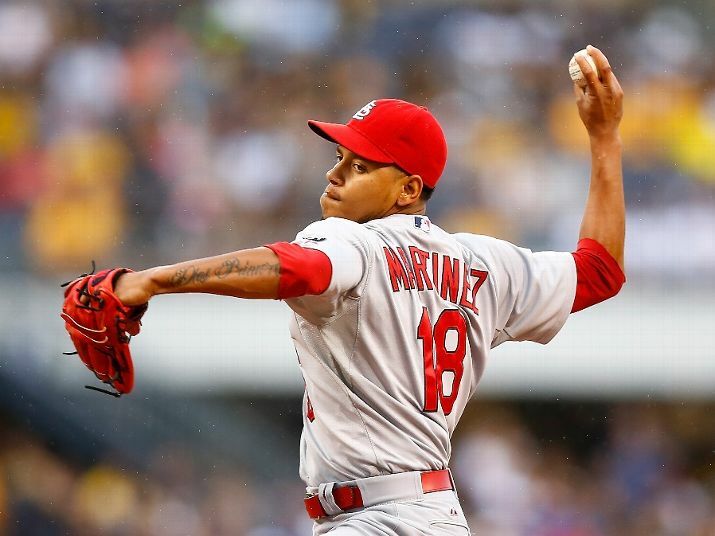 As the game progressed, Martinez kept shutting the Pirates down, as he threw scoreless inning after scoreless inning. And by the time he was taken out of the game in the bottom of the eighth inning, his final line of the game was: 7.1 IP, 4 H, 0 ER, 2 BB, 8Ks. Randy Choate entered the game in the bottom of the eighth to relieve Martinez, and threw a scoreless 1/3 of an inning. Seth Maness entered the game to pitch, and in the allowed a home run to McCutcheon to start the bottom of the ninth inning. Trevor Rosenthal then entered the game, and he kept the Pirates in check, as the Cardinals defeated the Pirates 4-1. The Cardinals improve to 56-30, as the Pirates drop to 50-35. Martinez is now 10-3 on the season, while Locke falls to 5-5. NOTE: With only one day left to vote, you can go on Twitter and use the hashtag #VoteTsunami to vote for Martinez to be on the All-Star team. You can also vote at mlb.com. Is the Cardinal Way the Right Way? Cardinals interested in Dae-Ho Lee?